Want to purchase an expensive HDMI cable with purported extra features? 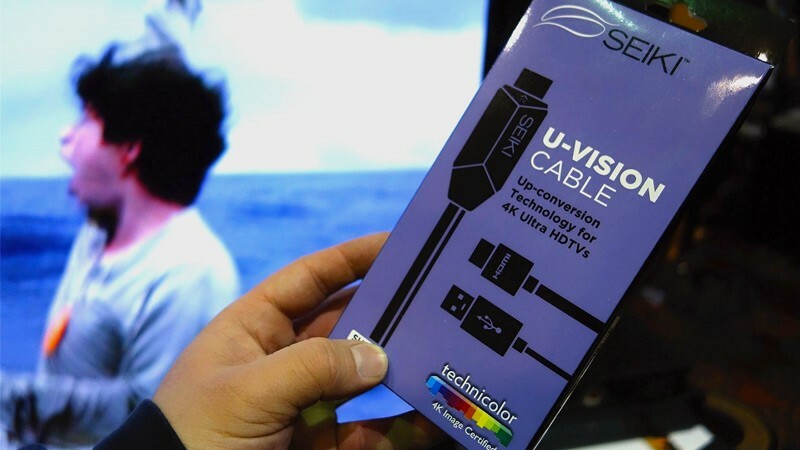 Perhaps Seiki's U-Vision cable will tickle your fancy, as the $50 HDMI cable is said to upscale 1080p content to 4K (and 720p to 1080p) on the fly, providing users with "dramatic image quality enhancement". The U-Vision cable is essentially a standard HDMI cable paired with a Marseille Networks VTV-1222 USB-powered upscaler chip, so yes, the cable also requires a USB port to function. It's claimed by Seiki that the cable provides the best level of noise reduction, edge restoration and detail enhancement while upscaling, all while being "Technicolor 4K Image Certified". Of course the U-Vision cable doesn't magically transform 1080p content into true Ultra HD, instead it merely upconverts and applies a small amount of processing to improve the quality. All 4K TVs have their own upscalers built in so 1080p content will fill the entire display, and many will post-process this signal so it doesn't look awful. This largely makes this U-Vision cable unnecessary, and could even have the adverse effect where an image is processed twice, causing a reduction in quality. Still, if for whatever reason you want to purchase this likely gimmicky HDMI cable, retailers such as Amazon will begin stocking them from today. A HDMI adapter that includes the upscaler chip will be available in Q2, for an undisclosed price.